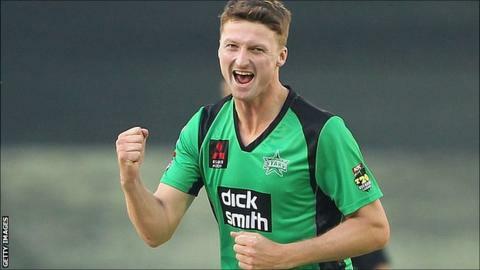 Hampshire director of cricket Giles White says overseas bowler Jackson Bird is still not fit enough to make his debut for the county. Bird, 28, has joined Hampshire for the first three months of the season. However, a shoulder injury has prevented the Australian pace bowler from appearing for the promoted side and he will miss the Warwickshire trip. "We're disappointed about Jackson and he is disappointed also," White told BBC Radio Solent. "We are hopeful he will play in the second team this week and will be ready for the next one against Nottinghamshire a week on Sunday." A back injury prevented Bird, who made the last of his three Test appearances against England in 2013, from playing for Northants last year. But White said he was hopeful the latest problem would not keep him out for too long. "It's something he carried over with him from a grade game," White added. "At first it didn't seem much at all but it's become uncomfortable and he hasn't been able to get full mobility in his shoulder. That's improving all the time." Meanwhile, fellow bowler Andre Adams is set to make his debut for the club after arriving this winter, having missed the County Championship opener against Sussex. "He is a player of quality and it's great to be able to take him up to Edgbaston," White said. "He's got overs in his legs and is ready to go." Hampshire lost their first game back in Division One, suffering a 92-run defeat against Sussex, and White admitted it was going to be a challenging season. "I think they are all going to be tough and we are going to have to compete very hard," he said. "At times in the last game we were excellent, I think day three showed our character and if we keep playing cricket like that and things go our way I have full confidence we'll get the results along the way."